This series is about jet airliners which failed, either technically or in most cases commercially. With only 12 examples built and 11 sold the French Dassault Mercure 100 was probably the least successful jet airliner of all time. Work began on the Mercure in the late 1960s to produce a competitor to the Boeing 737. The design was similar to the 737 though at 140 passengers capacity was a larger aircraft (the 737-200 being able to carry less than 120). The Mercure was the first French jet airliner since the successful Caravelle and was designed using Dassault's experience with jet fighters like the Mirage so that it had good high-speed characteristics, indeed was faster than the 737, and had good low-speed lift with it's advanced (for the time) wing. The first Mercure took to the air in 1971. Unfortunately Dassault could not sell it to anyone, the only order coming from French airline Air Inter. The main reason is thought to have been the poor range of the Mercure compared to it's competitors like the 737 and DC-9. The Mercure was designed for European air routes with a maximum loaded range of 400 miles whereas it's competitors typically had longer range which added to the operational flexibility. Just 10 production aircraft and 2 prototypes were made, far less than the hundreds originally envisaged. One of the prototypes was later sold to Air Inter. 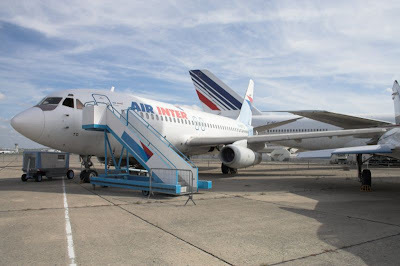 All 11 examples served their airline well, though Air Inter did receive a government subsidy. The Mercure was finally retired in 1995 after 20 years of trouble free service. Dassault tried to revive the design with versions that had more range, capacity and improved engines but these designs came to naught.